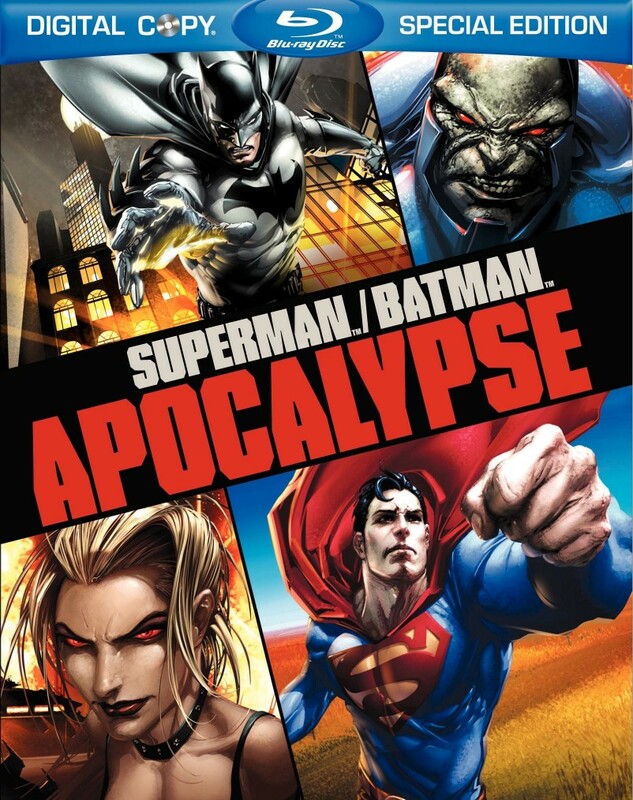 WORLD'S FINEST WAGE WAR WITH DARKSEID IN ALL-NEW DC UNIVERSE ANIMATED ORIGNAL MOVIE SUPERMAN/BATMAN: APOCALYPSE AVAILABLE FROM WARNER HOME VIDEO SEPTEMBER 28, 2010! BURBANK, CA, (June 29, 2010) - To save an earthbound Kryptonian, the Man of Steel and the Dark Knight unite once again - this time to battle the powerful forces of Darkseid - in Superman/Batman: Apocalypse, the ninth entry in the popular, ongoing series of DC Universe Animated Original PG-13 Movies coming September 28, 2010 from Warner Premiere, DC Comics and Warner Bros. Animation. The highly anticipated, full-length film will be distributed by Warner Home Video as a Special Edition Blu-RayTM and 2-Disc Special Edition DVD as well as single disc DVD. The film will also be available On Demand and for Download. 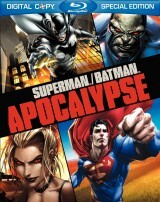 Based on the DC Comics series/graphic novel "Superman/Batman: Supergirl" by Jeph Loeb, Michael Turner & Peter Steigerwald, Superman/Batman: Apocalypse is produced by animation legend Bruce Timm and directed by Lauren Montgomery (Justice League: Crisis on Two Earths) from a script by Academy Award-nominated screenwriter Tab Murphy (Gorillas in the Mist). After a spaceship splashes down in Gotham City Harbor, Batman and Superman encounter a mysterious Kryptonian with powers as great as those of the Man of Steel. The Kryptonian is soon revealed to be Kara, cousin of Superman, who takes her under his wing to educate her about the ways of Earth. However, the villainous Darkseid has other plans. Seeing an opportunity to finally defeat Superman, Darkseid abducts and gains control of Kara, utilizing the powerful Kryptonian to do his bidding. It's up to Batman and Superman to save Kara, but they'll have to take the fight to Darkseid within his hostile world - where unknown, deadly threats lurk around every corner, including a brainwashed Kryptonian able to match Superman blow-for-blow. 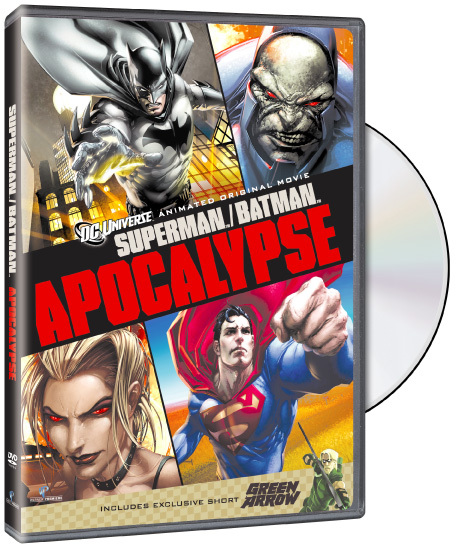 In addition to the feature film, the Superman/Batman: Apocalypse Special Edition Blu-RayTM and 2-Disc Special Edition DVD include the third DC Showcase animated short, Green Arrow. Screenwriter Greg Weisman's story finds Oliver Queen at the Star City International Airport to pick up his girlfriend, only to be forced into action as Green Arrow to protect the 10-year-old Princess of Vlatava from his old nemesis Merlyn the Magnificent and the League of Assassins. The short features the voices of Neal McDonough (Desperate Housewives) and Malcolm McDowell (Entourage). Bruce Timm is executive producer. Featurette: Supergirl: The Last Daughter of Krypton - A comprehensive look at The Maiden of Might from her introduction in the classic age of comics to her death in the "Crisis on Infinite Earths" crossover event to her appearance on Smallville and beyond. All-New Featurette: The New Gods - This documentary covers Darkseid's story, particularly in reference to the adaptation of Superman/Batman: Apocalypse. A primer on the wealth of material and stories contained in the New Gods series, along with a deeper understanding of why these characters - and especially Darkseid - are so memorable and important to the DC pantheon. Orion - The mightiest warrior on either New Genesis or Apokolips, Orion follows an almost Shakespearean arc culminating in the slaying of his father, Darkseid. This mini-featurette shines a light on this classically tragic character. Mister Miracle - This mini-featurette focuses on the greatest escape artist the universe has ever known and how he was traded in a peace effort to be raised by Darkseid, the enemy of all New Genesis. "Great things happen when powerful entities come together, and the partnership of Warner Premiere, DC Comics and Warner Bros. Animation is proud to continue this popular film series by once again uniting the two most popular characters in the DC Universe in a story that truly tests their strength, trust, loyalty, ingenuity and heroism," said Matt Bierman, Senior Vice President Production, Warner Premiere. "It is a testament to the larger-than-life nature of Jeph Loeb's blockbuster storylines that two of the first nine DC Universe movies are based on his work," said Geoff Johns, Chief Creative Officer of DC Entertainment. "Superman/Batman: Apocalypse lets us see Superman and Batman in action side-by-side again, but this time along with Supergirl and one of DC's greatest villains, Darkseid." "Just as Superman and Batman stand atop the DC canon of characters, so do the respective seminal voices of Tim Daly and Kevin Conroy in the hearts and minds of fans. Superman/Batman: Apocalypse will no doubt please comic-centric and mainstream audiences alike - particularly in the performances of Daly and Conroy opposite dynamic actors like Andre Braugher and Ed Asner, and fanboy favorite Summer Glau," said Amit Desai, WHV Vice President of Family, Animation & Partner Brands. 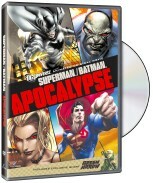 Superman/Batman: Apocalypse is distributed by Warner Home Video as a Special Edition 2-disc DVD, Standard Edition single disc DVD, on Blu-ray Disc, and On Demand and Download.